Sandra Boynton is my hero. She has the most amazing, most fantastically funny mind of any kids author out there. I was first introduced to her by a friend of mine who had her Philadelphia Chickens CD. And that's when I was hooked. I've loved every board book and every CD that I've been able to find by her. 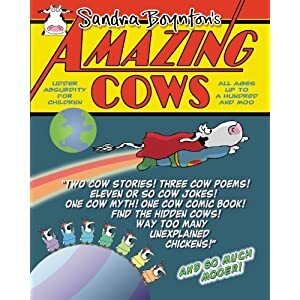 So when I saw that she had a new one out called Amazing Cows! : Udder Absurdity, I knew I had to borrow it from the library. And I don't regret it in the least. There's a little something for every fan of cow-related humor - knock knock jokes, short stories, fashion tips and, my favorite, a comic. Being the sci-fi fan of old as I am, the title also amused me greatly, being a spoof of Amazing Stories.